Cheju Ponies are from Cheju Island, off the southern coast of South Korea. They are used for riding and light draft. Horses were among the most important animals used for agriculture and military purposes from the period of tribal states (before the first century B.C.) through the Choson dynasty (fourteenth and nineteenth centuries). The Cheju native pony may have existed since prehistoric times, although no clear record confirms this. During the Korya dynasty (1276-1376), Mongolians governed Cheju and introduced their horses to the island. One record shows that 160 breeding horses were brought from Mongolia to Cheju and used for improving the native ponies. Since that time, horses raised on Cheju have been exported to the mainland of Korea and to China. 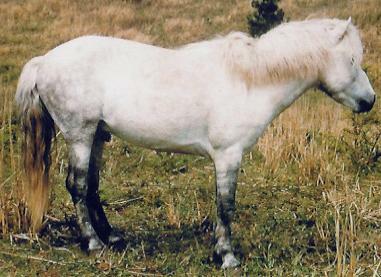 Native ponies were also used for crossbreeding with Mongolian and some other exotic breeds. During the Koryo and Choson dynasties, Cheju was a major horse producing area and 25 percent of the island's farm households were engaged in horse production. At one time there were as many as 20,000 native ponies in Cheju, but this number decreased with mechanization of farming and transportation to only 2500 by 1989. They are in serious danger of extinction. For their preservation, in 1987 the Korean government designated the Cheju native pony as a national treasure. Cheju ponies are outstanding, especially considering their small size. The can survive horribly severe winters without artificial shelter and are highly resistant to both disease and ticks. Mares foal regularly up to twenty or more years of age. They are able to carry loads up to 230 pounds. Their predominant colors are chestnut, bay, and black and occasionally gray, black, white, cream colored, or pinto. They have a nicely shaped head with a straight profile, large eyes, and small ears. Their jaw is deep, tapering to a small muzzle. Their neck is short and well muscled; their back is short and straight; their croup is gently sloped but their tail is set fairly high; their shoulders are often quite straight.